Such question is common online. This guide would show you how to convert MP4 video to QuickTime MOV on PC by using Leawo Prof. Media, an all-inclusive media converter suite that handles media conversion issues between video, audio, DVD, Blu-ray and online videos. If you’re looking for a Mac MP4 to MOV converter to help you convert MP4 to MOV on Mac, please check “How to Convert MP4 Files to MOV Videos on Mac“. There are many file formats that can be used to contain video files, such as MOV and MP4. 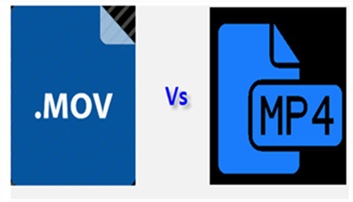 MOV and MP4 are two file containers that are usually used to hold lossy video. MOV was originally developed by Apple as a file format for its QuickTime Player. The MOV format presented a lot of advantages that are quite usable to everyday use but the proprietary nature of the MOV format was a major hindrance. The MP4 file format was later developed as an industry standard, the developments was greatly based on the MOV file format to the point that they were exactly identical at first. The changes that were introduced were very minor and mostly involved data tagging information. MOV and MP4 are just containers and they do not present any real effect on the quality of the encoded videos. That is up to the codec like H.264 and the others. Choosing between MOV and MP4 should be based solely on where you want to play the resulting videos. If it is only meant to circulate around the Mac community, then you are pretty safe with MOV but if you want to put it in your PSP or any other non Apple portable device, then you are better off with MP4. Leawo Prof. Media can act as an professional MP4 to MOV converter, helping convert MP4 to MOV free. In addition to converting MP4 to MOV, the multimedia combo can convert video and audio between various formats, including Blu-ray and DVD files. 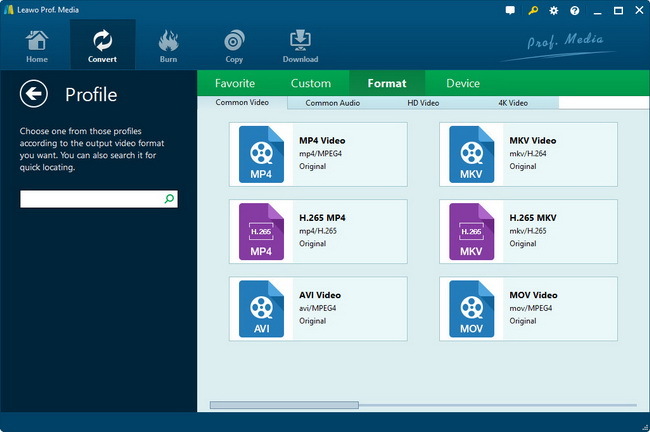 Download and install the best MP4 to MOV Video Converter on your PC. Get source MP4 videos ready and then launch this MP4 to MOV Video Converter. Open the “Convert” tab, then click “Add Video” button or directly drag and drop source MP4 videos for loading into this MP4 to MOV converter. Click the drop-down box next to the “Add Blu-ray/DVD” button. Open “Change > Format > Comon Video” group to set MOV Video as output format. Or if you want to get HD MOV videos as output, you could choose “Format > HD Video” to select HD MOV Video as output format. Note: You could adjust video and audio parameters like video codec, aspect ratio, frame rate, resolution, audio codec, bit rate, channel, sample rate, etc. by clicking the “Edit” option on the drop-down list. Save the output profile settings and return to the main interface of Video Converter Ultimate. Click the big green “Convert” button, set output directory in “Save to” box, and then click the bottom “Convert” button to start converting MP4 to MOV. After the converting process is completed, you can get the converted video file in MOV format in “Save to” directory box you set. Read the following to find out how to play MOV file with QuickTime on Windows. Go to Programs, QuickTime, and click QuickTime Player. Once QuickTime is opened, you can open the movie file through this program by clicking File, Open, and browsing to the location of the MOV file or by dragging the MOV file to Apple QuickTime. You can also select multiple MOV files at once and drag them to the program. You can also double-click the MOV file to start playing the file immediately. However, if the MOV file has been associated with a different program it may not open in QuickTime Player.